Today is the last day of the M&S Limited Collection style challenge! The week has absolutely flown by. I saved my favourite piece for last. How gorgeous is this jumper?? I love the swallow print and the muted colour palette makes it really versatile. 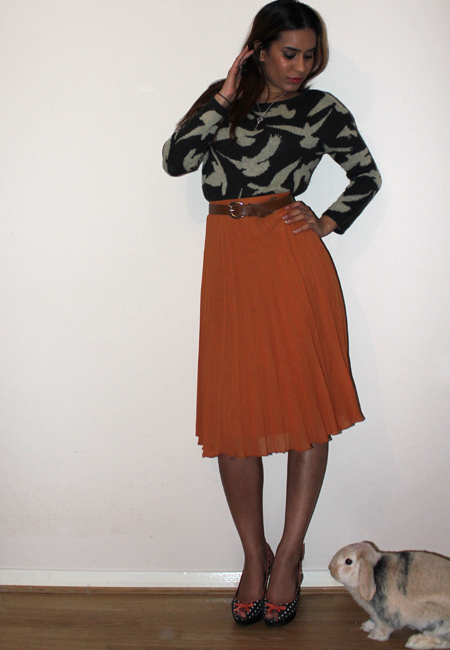 It’s cropped at the waist but I tucked it into my pumpkin orange pleated midi skirt for a bit of definition. The colour definitely perked up the outfit but without screaming ‘look at me’. The shoes are a favourite which I have literally worn to death, RIP beautiful polka dot peep toes! My housemate Bob the bunny got so intrigued with all the posing and flashes that he got involved in the mini-shoot, bless him. *Edit*. The winner has now been chosen. Congratulations, Tinkuke B. Love today's outfit, easily the best one. Have voted on the M&S Facebook! Have voted, love the outfit, you should definitely win today. Those shoes! You certainly have saved the best till last. This outfit looks stunning on you. Gets my vote! Stunning outfit, very classy. Have voted on M&S.Love the bunny! You've certainly got my vote today. Best of the whole week. Love the outfit, love the shoes and love the cute bunny. Very stylish, beautiful colour. Gets my vote. You look stunning. Wish I could carry it off but at 5'3" I don't think so! Love the whole look from top to toe…or should I say bunny! What a lovely stylish outfit. Certainly the best today. Have voted for you on Marks and Spencer's Facebook. Lovely autumn colour skirt. Lovely skirt, beautiful colour for the autumn as well as being very stylish. Get's my vote today. You look stunning today, love the whole outfit. Very cute bunny. Voted. Extremely stylish, helped by your fantastic figure, which I hope you appreciate! Has my vote on M&S. Great shoes and bunny. Gorgeous outfit. Absolutely love this outfit. The colour of the skirt is stunning!Have voted on M & S.
Love the way you have put this outfit together right down to the shoes. Have voted on Marks and Spencer. Love the outfit especially the skirt. Have voted. Lovely outfit as usual. You deserve to win. Have voted over on M&S Facebook. Love the outfit, looks really good on you. Have voted on M&S. Best by far. Hope you win. 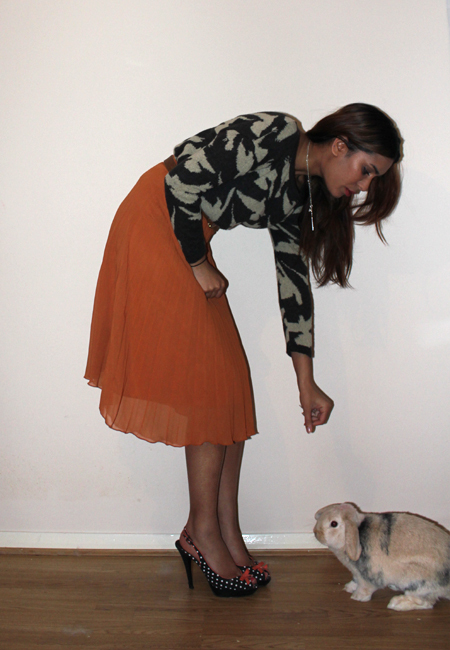 Love the way you have put this outfit together, right down to the shoes… and bunny. You certainly deserve to win. No competition as far as I'm concerned. Voted. Have voted for you on M&S. Your outfit certainly stands out from the rest, very classy. You remind me of Leona Lewis in those photos! Love the colour of the skirt. I would certainly wear this. Wasn't difficult to chose who to vote for today, as I said on the M&S comments, this is the first day I can honestly say I have only liked the one outfit. 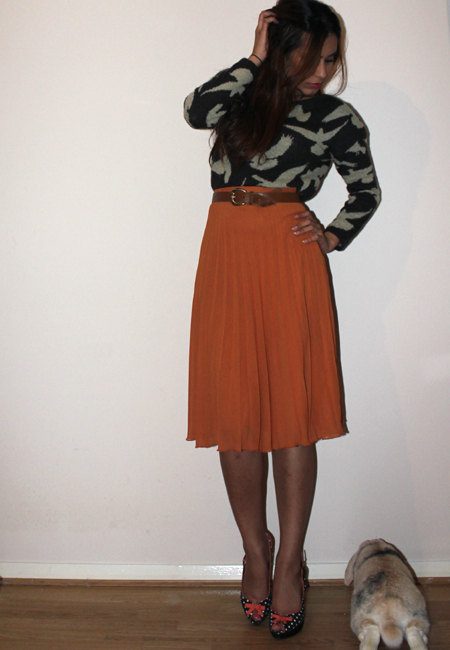 Absolutely love this jumper and skirt together. Hope you win. You certainly deserve to. Lovely bunny! You look stunning. Gets my vote any day. I think you outshone yourself today, absolutely stunning outfit, by far the best. The only one I voted for today. You certainly deserve to win. Voted for you on M&S again today. Love your look.Hope you win. Love the way you have put this outfit together. You wouldn't believe how stunning two simple items of clothing could look. Gets my vote. You really do deserve to win. Love your style, absolutely gorgeous. Gets my vote over on M&S. Simple but stylish, you get my vote today. Loved your look all week. Stunning. Got my vote! Simply gorgeous outfit. Love the shoes. Voted!